This post is part of my course on game theory. For an index, see here. The series follows the Ben Polak course on the Open Yale website. 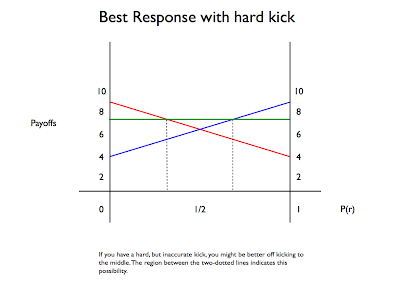 In the previous entry, we introduced the whole idea of best response, and showed how you could calculate your best response for all possible probabilities that you might attach to your opponent’s strategies. 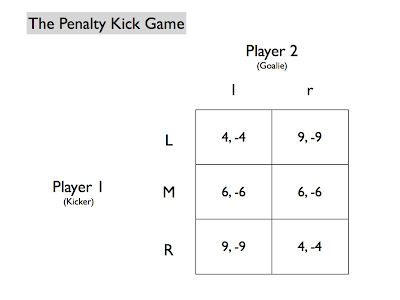 Now we can have a little fun with idea by looking at the penalty kick game. After that, we can give a formal definition of best response. The penalty kick game is a subgame within football (soccer). One player (the kicker) must kick the ball from the penalty spot towards the goal; the other player (the goalie) must try to prevent the ball from going in the net. Here’s a pretty spectacular example of this. In the game, the kicker must choose which part of the goal he is going to kick the ball towards. The goalie must anticipate this and dive in the direction in thinks the ball is going to go. Suppose, for sake of illustration, that the kicker has three options (left, middle, right) and the goalie has two (left, right). The relevant payoffs are measured in terms of the % chance of scoring. So, working with the following payoff matrix, the kicker has a 90% chance of scoring if he kicks to the left and the goalie dives to the right. The goalie’s payoffs are given as negative percentages. 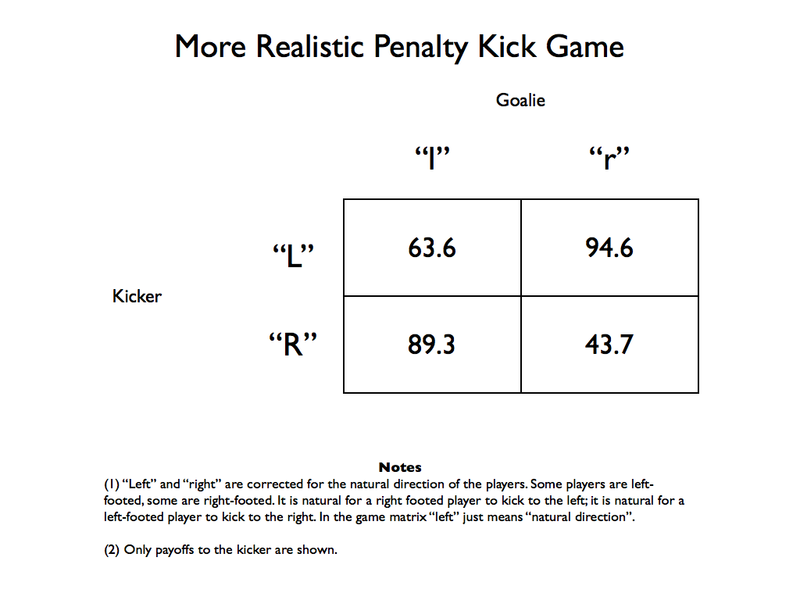 The game is definitely skewed in favour of the kicker, which seems to be true in the real world as well. 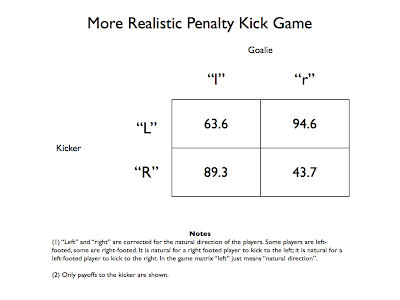 Without taking into account the probability with which the goalie will dive in a particular direction, we can see that L is a best response (for the kicker) to r; R is a best response to l; and M is never a best response. Once again, the foregoing analysis is incomplete. We need to draw a graph plotting the best response curves relative to the different probabilities of the goalie diving in one direction or the other. The following graph does exactly that. 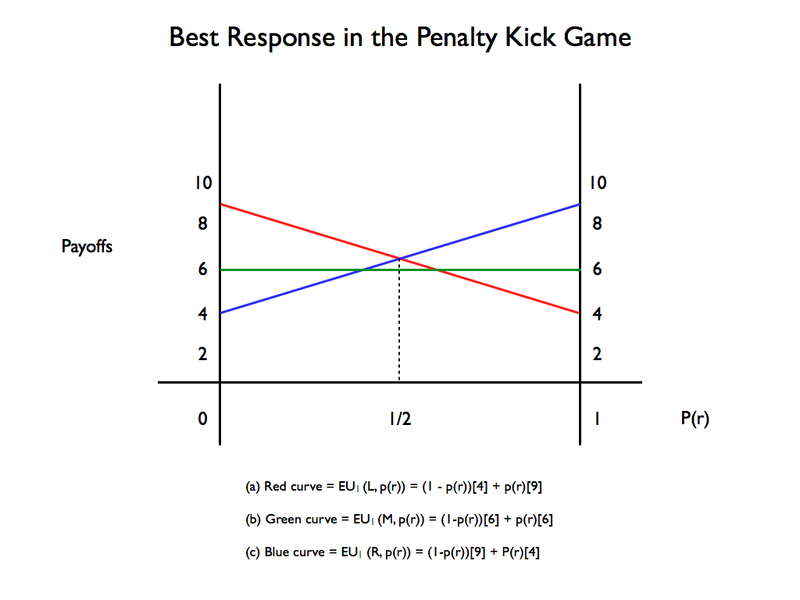 In this graph, the red line represents the expected payoff of kicking to the right; the blue line represents the expected payoff of kicking to the left; and the green line represents the expected payoff of kicking to the middle. Lesson: You should not choose a strategy that is never a best response. Of course, all this advice about never kicking to middle is a function of the model we created. We don’t actually know that kicking to the left when the goalie dives to the right leads to a 90% chance of scoring - we’re just guessing. Fortunately, some economists actually went out into the real world and collected some data on penalty kicks. One obvious thing they had to correct for in their model was the footedness of the players. Players will either be left footed or right footed (or maybe equally good with both feet). In general, it’s easier for a right footed player to kick to the left and vice versa for a left-footed player. 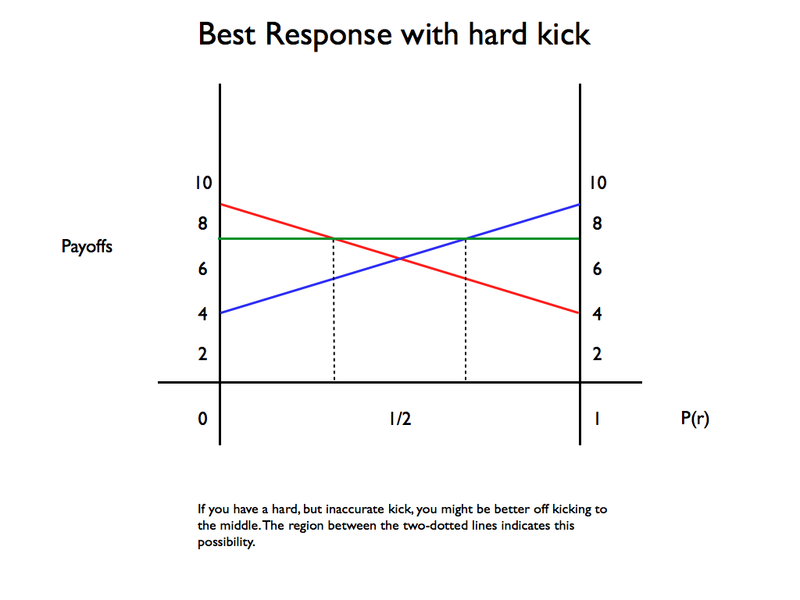 This means that the probability of scoring when kicking to your preferred side is likely to be higher. So correcting for footedness and ignoring the middle, the following are the percentage chances of scoring as discovered in the real world. (The data comes from this paper by Chiappori et al). In case your wondering, "left" on this model just means “naturally preferred direction”. As you can see, the payoffs are not all that different from those in the original model. There are other ways in which this model may be deficient. In particular it might fail to take into consideration other decisions that the kicker has to make, e.g. the flight of the ball (high or low) or the strength of the kick. It might turn out that kicking to the middle is a best response if the kicker can get a lot of pace on the ball but must sacrifice accuracy when doing so. This is depicted in the following graph. Okay, that’s it for now. We’re going to have to take a detour into some elementary calculus in the next entry. It’s very straightforward but it is necessary for understanding some of the models we’re going to be looking at in the future. "If you want to maximise your expected payoff...You should not choose a strategy that is never a best response." Some work in evolutionary biology indicates that it is sometimes better to choose a strategy that pays-off well under a wide variety of conditions, rather than a strategy that pays-off well under a narrow set of conditions. 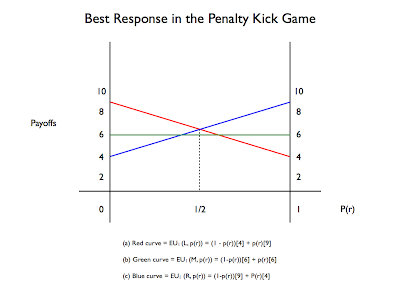 Of course, game theory is not evolutionary theory, so I'll try to phrase this in terms of the penalty-kick game. I wonder if the above rule is linked to the fact that the payoff function is linear in the given example. Imagine that one strategy has a moderate payoff under all conditions (i.e. all choices by the opponent), but for each condition there is another strategy that has a slightly higher payoff. The catch is that each of these alternative strategies has 0 payoff under any other condition. 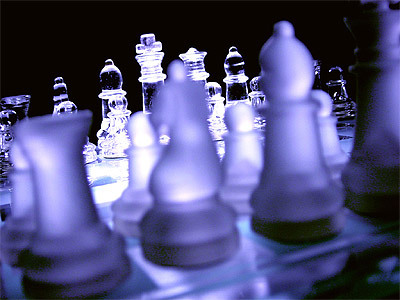 In this scenario, it would be best to chose the reliable strategy even though there is always another strategy that provides a better outcome, because given the uncertainty about the opponent's actions, there is an infinitesimal chance that any of the alternative strategies will have a payoff. True? Assuming I keep up with this series, evolutionary game theory will be covered at some stage. For the time being the focus is on single-shot games. I think I mentioned that at some stage. If I didn't, I am now. Calculations are different when dealing with multi-round games or repeated games (e.g. iterated Prisoners' dilemma). As for your other point, you can incorporate risk aversion into models of decision making. This can then account for the preference for the more reliable strategy.